Abstract: Maritime accidents and incidents, such as ship to ship collision or ship grounding, most often occur near ports due to the intensive water traffic and shallow water depth. The occurrence of those accidents place a port in a very dangerous situation, since the port could suffer from a high risk of blockage of port entry, and the consequent economic loss can be substantial. In the case of maritime accidents, it is of great significance for sea-going ships outside of the accident zone to determine a safe and smooth sailing route and efficient speeds at a busy port, thus to reduce the risk of blockage and the economic loss of the port, whilst not disturbing the current emergency logistic response system. In this regard, a decision-making method for safe and smooth sailing route and efficient speeds for sea-going ships encountering an accident can be very valuable. Because of the high nonlinearity of these decisions, PSO algorithm is used to search the safe and smooth sailing route and efficient speeds. The study results show that the proposed method can effectively achieve the safe and smooth sailing route and efficient speeds for ships encountering an accident, thus to be more economic and reduce the risky chance of blockage of the port entry. Reference: K. Wang, X. Jiang, X. Yan, G. Lodewijks, Y. Yuan, R.R. Negenborn. 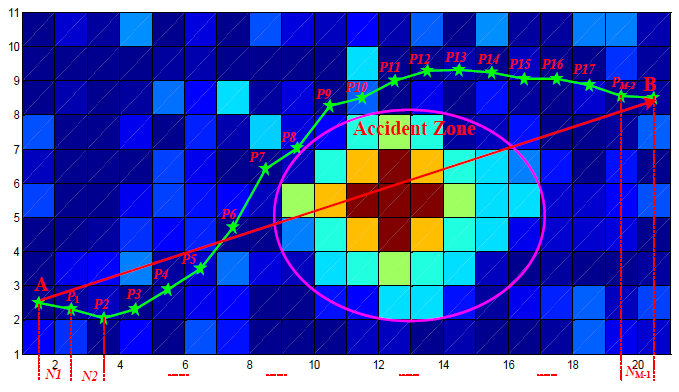 PSO-based method for safe sailing route and efficient speeds decision-support for sea-going ships encountering accidents. In Proceedings of the 14th IEEE International Conference on Networking, Sensing and Control (ICNSC 2017), Calabria, Italy, May 2017. 6pp.